An updating of a short paper read at the first Costume Society Symposium, London, April 19th. Notes from a talk by Joan Edwards. Formed into ornaments and then sewn on. Bead embroidery (1) is very skilled. Bead work (2) is unskilled. 1904 Berlin exhibition to show exploitation of home workers. Taken up by London clergyman who made up his own exhibition in Church Hall. 1906 another German exhibition featuring evidence gathered. Many workers hesitant to send examples for exhibition for fear of losing jobs. 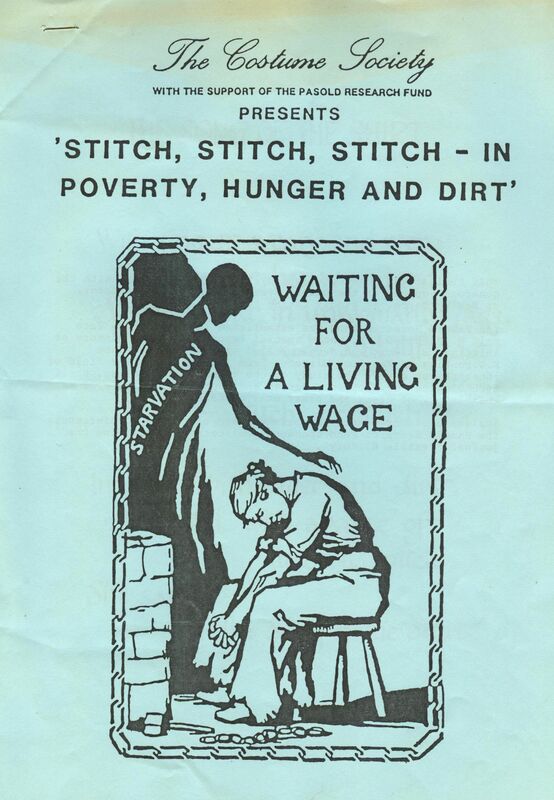 Women’s Industrial Council received report on embroidery as a home work (Included beaders and artificial flowers). Some cases of middlewomen, who finds workers and then pays them. Worker reluctant to give evidence. 14-15 hours a day needed for a living wage – i.e. 1shilling 1 ½ average. The posture needed for work caused bad eyesight and nerves. 2 May 1906 Daily news Sweated Industry exhibition. Showing workers in action. 30,000 visitors by 29th May at 1 shilling entry each. Fashion fluctuation makes trade varying. Low wages or no wages. Beading trying on eyes. 1907 Sweated Industries exhibition in Oxford opened by Viscount Milner. Beaders persuaded to take part, nameless, on stand 10. Number 19 worked beading on shoes – was paid 6 shillings a week, worked 12 hours per day, had to provide her own needles. Number 20 earned 5 shillings per week making beaded ornaments, had to fetch work (3 hours walking) – cut out buckram, bind it, sew on beads. Work bad for eyes. Exploitation still exists. Bengali workers in London, Brick Lane. Joan Edwards had just published the sixth of her small books on the history of Embroidery (The Bead Embroidered Dress) and was writing a biography of Dorothy Benson who worked for forty years in the Embroidery Department of the Singer Sewing Machine Company. Sweated labour in the shirt trade was one of the first areas in which it caught public attention; in the early 1840s the celebrated court case Moses V the Widow Bidell concerned shirtmaking and so, of course, did Hood’s ‘Song of the Shirt.’ This talk traces the trade’s development through the 19th century. Notes from a talk by Sarah Levitt. 1843: The Song of the Shirt – best known poem of the 19th Century – became a national catch phrase and a song. 1844 A play opened with the ‘Song’ as a prologue. 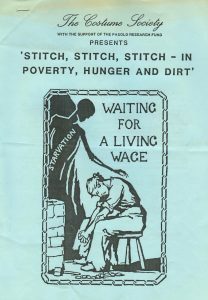 It drew the public’s attention to the plight of needlewomen. Seamstresses feature in novels of the 19th century. Romantic feeling about these girls due to ‘there but for the grace of God go I.’ Distressed gentlewomen, or poor middle class, officers and clergymen’s daughters. Distressed gentlewomen’s association set out to help. The alternative to sweated labour was often prostitution. Clothes making was one of the major industries of Britain between 1826 and 1914. The standard of living gradually rose all round – any amelioration of conditions must be set against the gradual rise all round. Clothing trade seasonal and utilised vast hordes of unemployed – i.e. Irish, Italian, and Jewish immigrants. 18th Century slop shops sold cotton and linen ready made shirts etc. These people became the outfitters of the 19th century and their workers became the sweated labourers as they poached into the tailorer’s trade. 1843 – Poem by Hood. 1844 – Children and Young persons’ act. 1849 – Henry Mayhew gives more info: ‘The worst work to be had.’ 6d per shirt if good, 2d for bad ones. Wages going down, outworkers. Early 19th Century shirts like smocks – no curves, in pieces. Low shoulder line, gathered sleeve, gusset under arm. Re-enforced front. Tunic shirts. Plain sewing was part of every girl’s education. Many miniature garments survive. Best shorts have tucked fronts and little gussets at top of side slits – very finely stitched. 1840s/50s new design in shirts. Raglan sleeves and better shaped. Shirt fronts were worn under waistcoats and jackets with false cuffs – no body to the shirt. A vast variety of shirts, shirt fronts, collars and cuffs – 97 types of shirt, 18 versions of flannel shirts, at least 12 different fronts. Collars and cuffs could be reversible. Paper, celluloid and rubber collar and cuffs available. Flannel shirts very popular. Striped cotton shorts known as regatta shirts made for 10d per dozen. Collar and cuff making were a separate trade. 1915 1/5, 4/9, 2/6 per dozen machine made shirts. London a centre for shirt making, but also Manchester, Glasgow, Taunton, Leeds etc. By the end of the 19th century Ireland was an important centre for shirt making in factories. Firms came from Glasgow, London, and Manchester to set up factories. 1855 – sewing machines installed for shirt making. By 1858 200 machines using 200 yards of cotton per day. Sewing machines expanded the sweating system. Finishing was done by outworkers at home. It was not possible to unionise outworkers. Could not band together to help themselves. 1909 Trade Boards Act tried to protect these workers. Army, post office and government departments acted as exploiters, setting minimum wages (only just abolished). Sarah Levitt was Assistant Curator at the City of Bristol Museum and Art Gallery. Previously Assistant Keeper at Platt Hall, Miss Levitt has an MA in The History of Dress from the Courtauld Institute of Art. Her interest in shirt making stems from research for her book published the month of the conference, Victorians Unbuttoned: Registered Designs for Clothes, their Makers and Wearers. Black crape was produced in large quantities in Victorian times for the mourning garments of the middle classes. This session looks at the lives and conditions of working class women and girls employed by Courtaulds in an Essex mill to make the crape. Courtaulds is one of the ten biggest national textile companies in Britain, and exports all over the world. Samuel Courtauld started in Essex in 1815. In the 1820s he had only a handful of workers and made £100 per anum. In 1881 he died, leaving 2 ½ million pounds. The family made a fortune out of silk. Textile work is a female orientated trade. Essex was a thriving silk producing area in the early 19th century, but by 1860 many firms were extinct. Courtaulds survived, employing 75% of women workers in the mid 19th Century. Silk manufacturers looked for new places for their industry. Essex was an ideal location and the industry moved there, where there was surplus labour to be taken up, which could be cheaply employed. The main produce was black silk crepe, with a special weave produced by Courtaulds for the mourning trade. This had a real boost in 1862 on the death of Prince Albert. The special machinery developed for this was worked by young people – girls to 17, boys to 15 – silk winding only. Only men were allowed to work the crimping machinery, and the crimping room was kept locked. Halstead mill workers in the 1850 – women workers wore aprons, with male overseers. Men were engineers and mechanics. The mills were 3 miles apart and material was transported from one mill to another for different processes. Men were employed as drivers and waggoneers. There were rules about not wearing crinolines which were considered dangerous (machinery) and indecent (when standing up on machinery). (The family (Courtaulds?) were Unitarians with radical traditions, but were opposed to protective legislation – they felt that employers should create a family atmosphere in mills, not rely on the law). Middle-class families were realising the ideal of ‘woman in the home.’ This threw up the position of working class women who needed to work. The ‘patriarchal family’ system kept women at the bottom of lists. There was a good deal of concern about working women not learning domestic arts. A school was set up in the factory for young women. Mary Merryweather was the school teacher. She kept a diary, recording: 120 girls first week – free – class overfull. Girls were noisy and unruly. No womanly constraint. A nursery was provided. Rules were strict but not understood by women who did not agree with too much clothes changing. It only ran for 3 years. Other innovations included a room being provided for meals, and an Amusement society (in the late 19th century) – an early social club. Dr Judith Lown was working full-time for the ILEA in their Adult Education Training Unit, based at the City Literary Institute. Dr Lown’s research on the Courtaulds silk industry was carried out between 1977 and 1983, and was being written up as a book. For young girls preparing for their ‘coming-out’ the choice of spectacular dresses to wear at the prescribed events was a major consideration: this talk is about the women who made these dresses working for long hours undertaking tedious and intricate work for low wages. Two classes of dressmakers – honourable, and sweated. 1st class – was suitable work for those not fitted to be governesses or similar. Daughters of clergy, middle class etc. Dressmakers made garments. Milliners made hats, caps, and trimmings. March to July were busiest seasons, the highlight being court presentation. Dress required – had written regulations, must have long train, feather headdress and veil. Dresses of silk, tulle, ninon (see: https://en.wikipedia.org/wiki/Ninon ) They were a great consumption of fabric. Girls lived in cubicles in dormitories, 2 girls to a bed. Workrooms were crowded and un-ventilated. Windows were unopened so as to keep out smuts. There was no chance of exercise, and fresh air was lacking. Meals were consumed rapidly at irregular hours. They were unappetising. A 12 hour day was normal but in the season could be 6:00am to 11:pm, and sometimes they worked all night for Royal drawing rooms to complete orders. Trimming dresses and making trains involved standing for long hours. This case inspired research and many horror were uncovered. The system and conditions undermined health. The mortality rate of needlewomen was thrice that of other classes of occupation. Some hands were dismissed for giving evidence. Many earnest moves were made to alleviate conditions. Societies formed, and authors wrote of milliners and dressmakers in books. A few employers relaxed their systems and allowed a reduction in hours. 1869 – laws to prevent more than 12 hours for dressmakers, but were difficult to enforce. Customers were responsible by wanting dresses at short notice. 20th Century – girls still sometimes worked all night to finish orders. In 1863 1 hand, plus 1 apprentice took 1 day to complete a dress. By 1870s day work (non living-in) was becoming more common. However, senior hands still lived in. Much of this work was done by hand. Sewing machine work was very unpopular, and it was mainly used for foundation work and skirts. Joanna Marschner was (at the time of the conference) Assistant curator of the Court Dress collection, Kensington Palace. She had previously been Museum Assistant in the Department of Costume and Textiles at the Museum of London. In February, 1986, the Costume Society, in association with the Pasold Research Fund, presented a ‘Sweated Trades’ seminar, focusing on the harsh realities which produced the handsome clothes of the 19th Century, and the Victorian age in particular. The presentations considered how seamstresses, employers, and, for that matter, the wearers, were locked together by the rigid bonds of Society. My mother attended the seminar, and made notes during the lectures, some of which will have informed her own work over the years. Those notes will be transcribed as a series of entries in this Blog, more or less as they were written thirty years ago. Plying her needle and thread. Stitch – Stitch – Stitch! Notes from these presentations will follow, each as a separate post. Their contents may be of interest to anyone writing, researching, or even role-playing, in 19th Century settings. Writers of Victorian crime, fictional social history, or fantasy may find ideas for settings, characters, or even plot. Steampunk aficionados may wish to consider just who made their wonderful outfits, and how much they were paid/rewarded. These are just notes, and are presented as starting points for personal research, rather than comprehensive facts. Where relevant, web links will be added to help point interested parties at further avenues of research.